The new Koss Porta Pro® Wireless takes the legendary sound and the iconic design of the classic Koss Porta Pro® headphones - wireless. The Koss Design and Engineering teams collaborated to create the perfect wireless configuration using Bluetooth 4.1 with apt-X to ensure the Porta Pro® Wireless Bluetooth headphones maintained the classic Sound of Koss® profile listeners have been enjoying since 1984. The Porta Pro® Wireless Bluetooth headphones feature a rechargeable lithium-ion battery that can last 12+ hours. In-Line controls on the Porta Pro® Wireless Bluetooth headphones allow users to wirelessly change songs, answer/end calls, change volume, and much more*. A microphone is integrated with the in-line controls giving users the ability to talk wirelessly on the phone, record audio and control their source device*. Like the Porta Pro® Classic headphones, the Porta Pro® Wireless Bluetooth headphones have adjustable temporal pads to relieve pressure on the ears. Its lightweight, open-air cushions for hear-through sound keep listeners aware of their surroundings while delivering exceptional sound performance. Oxygen free copper voice coils and dynamic elements allow the Porta Pro® Wireless Bluetooth headphones to deliver rich bass and a remarkably wide frequency response. 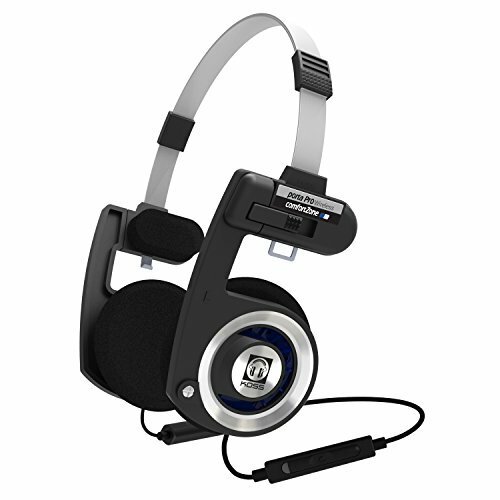 Porta Pro® Wireless Bluetooth headphones ship with the new Porta Pro® Hard Case (link?) included. View More In On-Ear Headphones. If you have any questions about this product by Koss, contact us by completing and submitting the form below. If you are looking for a specif part number, please include it with your message.